While most kids have memories of sleepovers with friends, I remember sleepovers at my grandma’s house until I was16. Our days were full of fresh food, lemonade and stories of her life on the farm in Alabama with 12 brothers and sisters. One of our favorite projects was gardening. We tore open small bags of seeds that said ‘cucumber,’ ‘squash,’ ‘watermelon’ and ‘tomato,’ marveled at the various colors and shapes of wire for the garden’s perimeter. Then we’d grab three good shovels, the sprinkler and of course a few old fashion southern sun hats. “Let’s go fool around with this ol’ garden,” Grandma would say. I couldn’t wait for the moment when the barren dirt would spring with life and colorful fresh vegetables would emerge. Grandma’s eyes filled at the sight and I always wondered why it meant so much to her. Years later I realized she was remembering life in the south as a sharecropper, when she and my grandfather were forced to turn over part of their garden’s harvest to a landowner in exchange for land. 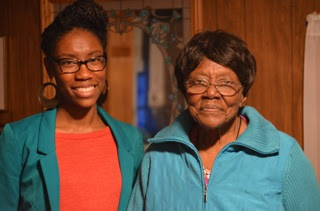 During this Mother’s Day season, I am reminded of my grandma’s compassion and tenacity, qualities that have shaped my own personality and strengthened my family. Her mother, my great grandmother, didn’t have much money but did the best she could to encourage her kids to value education and trust God with everything. Growing up in segregated Alabama, Grandma witnessed senseless violence and racism that prevented her from experiencing simple pleasures like purchasing a Coke from the local store. Two of her siblings died from heart attacks in their twenties and one drowned. When Grandma was in her twenties, she and my grandfather had an altercation with the family they sharecropped with and moved north to a predominantly white suburb in Massachusetts. Adjusting to the new environment, juggling several job, four children and church commitments, helping extended family and surviving multiple accounts of domestic violence, my grandmother persevered silently, spreading her love to others without recognition or reciprocity. Now an 85-year old queen and mother to all who she meets, she is more determined than ever, and wouldn’t think of missing my graduation to watch me receive my diploma, an honor she never had because she didn’t go to college. Bearing her first name Louise as my middle name and embracing its powerful meaning, “famous warrior,” I know I’ve survived these challenging four years of studies with God’s help and her great legacy. Though her life has been intense, Grandma still smiles and gives freely to those around her. I am so grateful to have her as a role model as I move on to life after college. Even when the going gets tough, I’ll always remember her saying, “Don’t cry about it! Just pray and have faith.” It was a seed she planted in me long ago that I hope yields good fruit. Alanah Percy is graduating from Gordon College with a bachelor’s degree in kinesiology. She was a journalism Fellow with the Gordon College News Service. It is always special to write about your mother and learnings from her. I would like to invite you to contribute to assignment help blog as well. am hear to share my experience with the world on how i got my ex husband back and saved my marriage.what a wonderful man who has brought light to my life,my god will continues to bless DR Ofemo for his work of spell caster, because he help me with his powerful spell caster work.i must confess that this DR Ofemo is bless with his wonderful power as a spell caster and i must thank my friend Susan who introduce me to this wonderful man the spell caster who make me find happiness in my life again,after 24 hour when this wonderful man cast spell for me my life change automatically my ex husband who has left me for another woman for the pass 5 years came back to me for forgiveness which i never hesitate that he had realized his mistakes I just couldn't believe it anyway we are back together now and we are happy together with my two kids, contact DROFEMOSPELLTEMPLE@GMAIL.COM I have introduced him to a lot of couples with problems across the world and they have had good news... Just thought I should share my experience cause I strongly believe someone out there need's it, his email:DROFEMOSPELLTEMPLE@YAHOO.COM or contact his cell phone number+2348163387496 or his web/site: http://drofemospelltemple.wix.com/dr-ofemo. Its nice post! grandma has many parallels with people in my life the she was an awesome lady my mom 's mother her best to tell her age when anyone asks but my mom mother is a supremely intelligent woman. Pingtutor helps to finish your school and college homework, we assure to provide the homework help based on subjects. we have lot of experince in setting up the online tutorials and college assignment and we provide the best result on homework and assignment as early as possible. Indeed Dr.ABU is really the best love spell caster caster online i just benefited from his spell my lover that left me came back to me after i contacted him and since then my lover has been extra-ordinary caring and the most beautiful news about this whole thing is that we are getting married in few months time. All this was made possible because of the help that Dr.ABU rendered for me. I want the world at large to also benefit from his powers so i will be giving out his direct contact info for you to reach him and get that problem eating you up in your relationship solve all within the space of 48hours. Well, nothing I want to say but great! I hope you'll make more useful post in the next few days. خُدعنا لسنين.. لم يكن طرف الممحاة الأزرق مخصص لمسح كتابات القلم الحبر! Do you know what happens to a man if you eat 100 grams of pistachio? What are the benefits of onions? hi Alanah Percy you done a good work. I am also with my grandmother on that day. She give lot of good messages with her experience.The aged people's thinking power is great I know. I am glad to come across this post since i also loved staying with grandmother. I can always witness that, it is always enjoyable to live with grandmothers. Keep on sharing such posts! Need urgent Thesis Writing Help or research help on any topic? Do not hesitate to consult us at anytime. Very happy to hear such wonderful story about mother and her sacrifice. Thanks for sharing such beautiful post and of course writing so effectively! I really cant imagine where i would have gotten better advice from if not from my grandma, so when i so this post i was very happy to see that grandmas are doing a great job. With a very beautiful Hemp Rope Chandelier Light, you will not only be making your house classy but also get the kind of light that is healthy for your eyes. Being the most well-known travel place in Indonesia, Bali has one of the best beaches in the world. Many come to Bali maybe for the culture, the arts, the temples, diving, surfing or even the food, but one thing for sure it is also for the Bali beaches.Being the most well-known travel place in Indonesia, Bali has one of the best beaches in the world. Many come to Bali maybe for the culture, the arts, the temples, diving, surfing or even the food, but one thing for sure it is also for the Bali beaches. Bebek uyku ürünleri piyasasında gerçekten iyi bir adres arayışında olanlara uzun yıllardır satışını gerçekleştirdiği çok sayıda kaliteli babynest seti ile ünlü olan babynests.com adresi tavsiye edilebilmektedir. Her biri birbirinden kaliteli bebek yuvası ürünleri ile mükemmel bir set haline gelen babynest setleri, piyasada yer alan diğer rakip firmalara nazaran oldukça cazip fiyatlandırmalar ile babynests.com adresi üzerinden müşterilerin beğenisine sunulmaktadır. Emzirme yastığı, ortopedik yastık, ince örtü, battaniye, puset örtüsü, emzirme önlüğü ve baş yastığı gibi farklı pek çok bebek uyku ürününü bir araya getiren babynest setleri ile popülerliğini koruyan babynests.com adresindeki tüm ürünleri WhatsApp üzerinden sipariş verebilme olanakları müşterilere sunulmaktadır. Anne karnındaki gibi güvenilir bir alan oluşturmak isteyen anne ve babaların her daim öncelikli tercihlerinden birisi olan babynest modelleri konusunda en iyi seçenek olarak da tanımlanabilecek babynests.com adresindeki yatak ürünleri sayesinde bebeklerin nerede olurlarsa olsun son derece huzurlu, sakin ve rahat bir uyku çekmeleri mümkün olmaktadır. penawaran terbaik dari kami mengenai harga u ditch dan juga harga beton precast, banyak pilihan jenis beton yang dapat kami jual, diantaranya harga pagar panel beton dan juga harga box culvert dengan penawaran terbaik. selanjutnya informasi mengenai harga jayamix merupakan bagian dari penawaran harga ready mix murah yang terkait dengan informasi harga beton instan Jayamix, banyak jenis mutu yang dapat anda tentukan. Selanjutnya kami juga menawarkan harga sewa alat berat yang cukup murah, tidak luput dari penawarannya yaitu harga sewa crane, bagian utama dalam pemasaran kami untuk jasa sewa alat berat. Informasi lain yaitu harga pagar panel yang cocok untuk proyek pemagaran anda. احتمال دارد زمانی که ماشینی اجاره می شود مشکلاتی برای اجاره کننده و اجاره دهنده اتفاق می افتد . از این سری از مشکلات در کرایه خودرو می توان به مواردی اشاره کرد .مانند : میزان مسئولیت پذیری اجاره کننده ماشین یعنی در واقع کسی که خودرو را اجاره می کند آن را به سمت به دست صاحب خودرو برساند و در واقع امانت داری را به بهترین شکل رعایت کند تا هم خودش متحمل هزینه زیاد خسارت وارده به ماشین نشود و هم اینکه اجاره دهنده وسیله را دچار زیان نکرده باشد .